One of the most tedious aspects of fall yard work is raking the leaves. Although making them into piles that your children and pets will later jump into is plenty of fun for them, you’ve got more interesting things to do with your day. 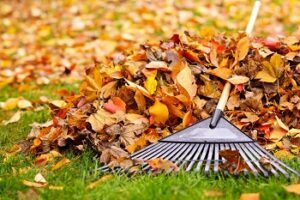 Don’t waste your weekend day struggling to rake the leaves from all the trees in your and around your yard. The wind can be your friend, or it can be your enemy. Generally speaking, if you have the chance to pick the day (let’s say, Saturday) you have to rake the leaves, make sure it’s on a day where the wind can help you. At the very least, make it a day where the wind won’t work against you. If you rake against the way the wind is blowing, it will just take much longer than necessary. Another key to efficiency when you have to deal with the leaves is to just be patient. For instance, allow all of the leaves that might possibly fall into your yard to do so. If you rake little by little, you might think you’re saving yourself some time and energy. But this will only slow the whole process down. Staying on top of yard maintenance is just as important as avoiding procrastination. When you have to do any work in your yard, it can be hard to stop. Whether you are raking the leaves or mowing, or mulching, remember to rest when you need it. Stretching and exercising will also help you feel better. Be sure that you don’t overlook the importance of your posture. And even in colder temperatures, you can still work up a sweat, so don’t forget to drink enough water. This entry was posted on Friday, November 10th, 2017	at 8:40 am	and is filed under Landscaping Maintenance	. You can follow any responses to this entry through the RSS 2.0	feed. Both comments and pings are currently closed.